Sunday, July 18th: Report back from activists who attended the US Social Forum in Detroit, June 22-27th. FORWARD! is an ongoing gathering of white folks working for Racial Justice. We will work to educate ourselves to be strong anti-racist allies in our community! We will gather to learn about the organizing being done in communities of color and how we, as white folks can support this work. 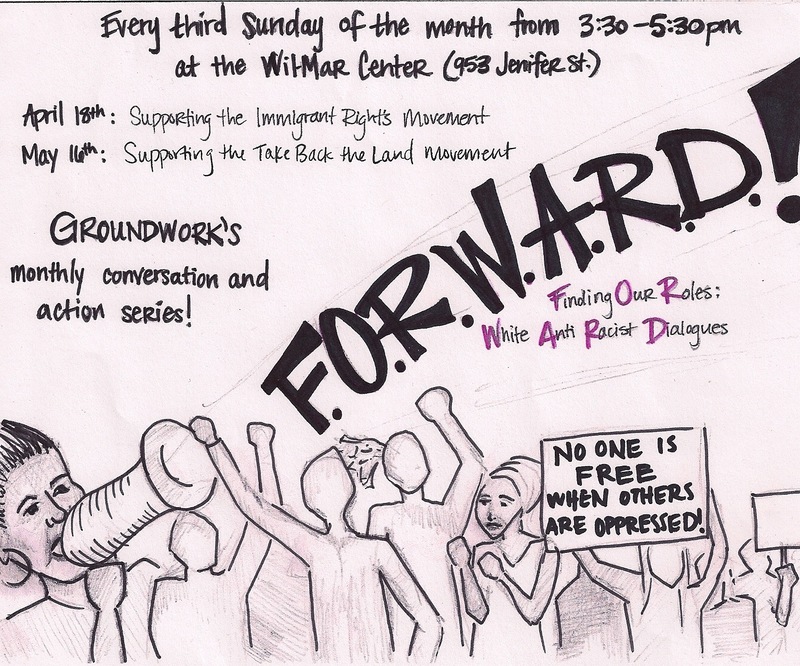 These gatherings offer a space to recognize and process racism we see in ourselves and our communities. We come together to learn much needed skills to broaden our understanding of racism and combat it effectively and directly from our hearts. If you can’t make it to all of them, its okay, you chose your level of involvement. The forums will vary from month to month, involving both presentation and open discussion time. We ask people to come with questions, while having faith in the process- give the agenda a chance to answer. We will work to develop strong white leaders who have a clear understanding of systematic racism, how it affects communities of color, and of what ally-ship looks like. Please note: people of color are welcome to attend, understanding our goal to develop strong, accountable white anti-racist allies.